Friday August 6th 1909 Alice Lindley and her husband came up to see us and helped us to get started on as they Fannie & William went to the depot with us. We left there before noon. The scenery through "The Royal Gorge" was fine. We are supper in the dining car near Lead-ville. I felt fine when in the mountains. weather warm below Saturday August 7th 1909 We reached Salt Lake City at 1.30 and went directly up in the City and found Ralph Black. we found a place to rest for awhile and then when to supper with him. He stayed with us till we left for Ogden at [just?] midnight. There were great crowds in this city on account of the S. A R. meet here. 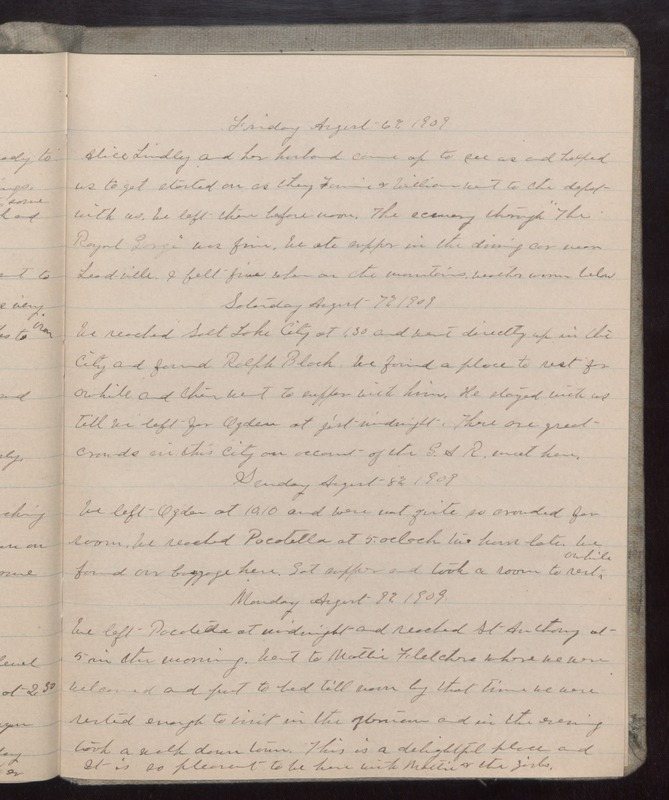 Sunday August 8th 1909 We left Ogden at 10.10 and were not quite so crowded for room. We reached Pocatella at 5. oclock two hours late. We found our baggage here. Eat supper and took a room to rest awhile Monday August 9th 1909 We left Pocatella at midnight and reached St Anthony at 5 in the morning. Went to Mattie Fletchers where we were welcomed and put to bed till noon by that time we were rested enough to visit in the afternoon and in the evening took a walk down town. This is a delightful place and It is so pleasant to be here with Mattie & the girls.